Have you ever wondered how and why we started faxing? Or how faxing itself has evolved over the years to the point where it’s at now (i.e. easier than ever before)? It has a long history, and it’s certainly come a long way – even in just the 21st Century alone! 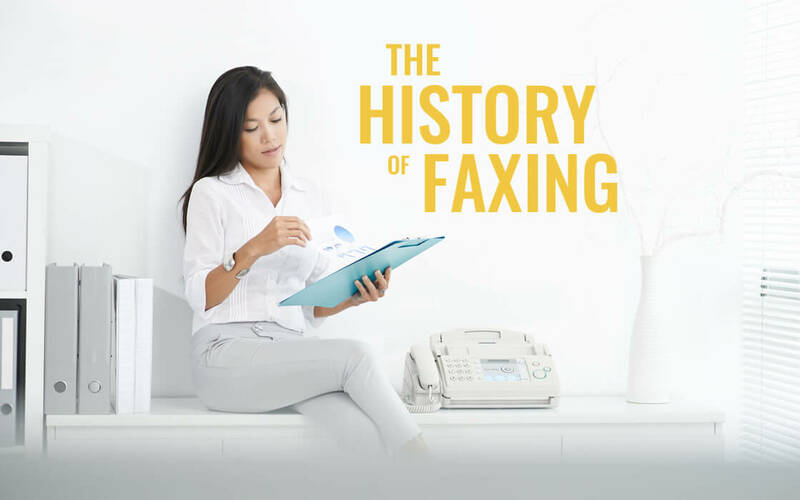 Today, we’ll reveal the history of fax machine and faxing, a mainstay of modern communications. The first fax machines were very primitive, and they lacked many of the capabilities you see today. Still, as you’ll see, the technology was impressive for the time period. It started with Scottish inventor Alexander Bain. A few years removed from inventing the electric clock, he was ready for his next endeavor. He used elements from the clock to assist in his invention of the fax machine (specifically the movement of two pendulums for line-by-line message scanning). He patented the fax invention on May 27, 1843, and faxing finally came into existence. However, that was just the beginning. Several inventors would improve on Bain’s machine over the next half-century. Frederick Bakewell and Giovanni Caselli made arguably the biggest improvements. Once they were through with it (around 1865), people could send images over telegraph lines. This is even more impressive when you consider that workable telephones wouldn’t be invented for the next 11 years! Without steady and consistent competition within the fax industry, fax may not be where it is today. There seemed to always be different types of fax machines – and different inventors – competing with each other throughout the decades. There was Shelford Bidwell in 1880, who made it possible to scan two-dimensional originals without manual plotting or drawing. Then Elisha Grey in 1888 who made it possible for users to send signatures over long distances. The innovation continued in 1924, when Radio Corporation of America (RCA) invented the wireless photoradiogram, which led to the first picture transmitted through radio fax. In that same year, AT&T transmitted the first color fax. Fax became more and more widely used as a result. Banks like Western Union began using radiofax receivers regularly, and the US army even transmitted its first photograph via fax to Puerto Rico in 1960! This machine could be connected to telephone lines and transmit letter-sized documents in 6 minutes. This set the standard for fax, made it less expensive, and increased its popularity and usage. 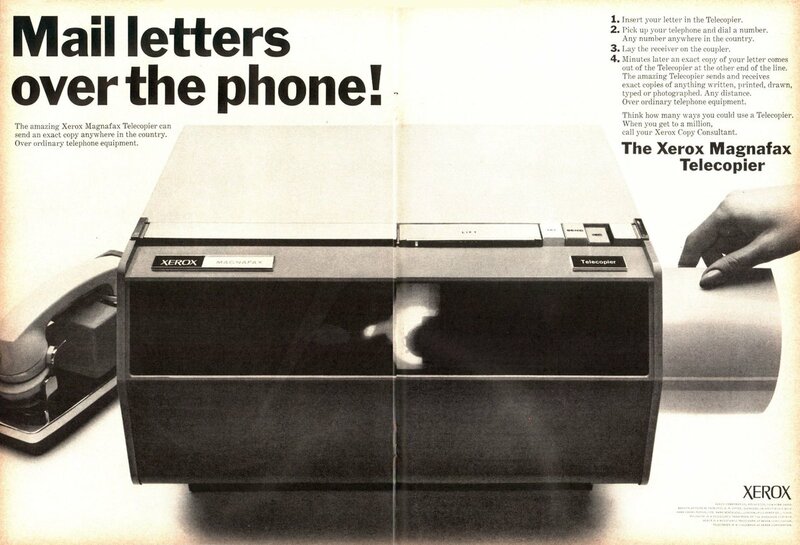 This is an ad for Xerox’s MagnaFax Telecopier, the first machine to be mass produced and marketed. Xerox continued making improvements to the machine, and other companies stepped in as well. The number of US fax machines increased from 30,000 to 300,000 between 1973 and 1983. Then in 1985, before the internet was in full swing, Hank Magnuski, found of GammaLink, created the first computer-based fax board. This allowed computers to join the network of fax machines, which still dwarfed the Internet at that time. This helped dramatically increase the number of US based fax machines – the number rose from 300,000 to over 4 million by 1989, and fax was revolutionizing the way we communicated. Fax machines ruled the stage throughout fax’s history. However, that has changed in the 21st century. More and more people are canning their clunky fax machines in favor of simple internet fax services. These apps have streamlined faxing and have enabled those who don’t typically fax to embrace the technology when necessary. All without the need for their own machine (or a trip to the store). App technology not only makes it easier to send and receive faxes, it’s also more time and energy efficient, and better suited to today’s on the go lifestyle. The history of fax is rich and eventful. So where does it go from here? Does it evolve again? Will it slowly become a dinosaur? For now, faxing is still commonplace around the world. Fortunately, thanks to our ability to ditch the machine, and switch to an app, it’s easy to comply for as long as this technology stays around!